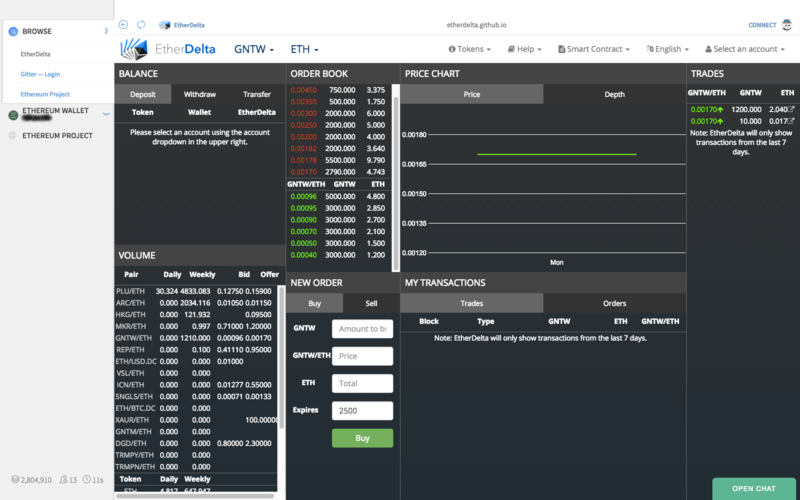 Here is EtherDelta’s screen running in the Ethereum Wallet application, executed to operate as Mist by using the command line parameter --mode mist, and then navigating to the URL https://etherdelta.github.io/#GNTW-ETH. EtherDelta is produced by https://etherboost.github.io/. //Default assumes totalSupply can't be over max (2^256 - 1). //If your token leaves out totalSupply and can issue more tokens as time goes on, you need to check if it doesn't wrap. //Replace the if with this one instead. //same as above. Replace this line with the following if you want to protect against wrapping uints. //remember to call Token(address).approve(this, amount) or this contract will not be able to do the transfer on your behalf. This entry was posted in Blog and tagged Decentralisation, Ethereum, Exchange, Smart Contract, Source Code. Bookmark the permalink.